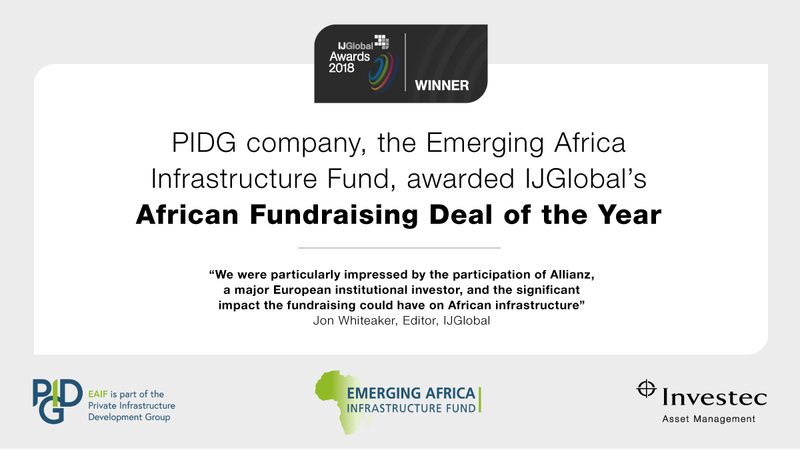 IJGlobal, the specialist global infrastructure market intelligence organisation, has awarded PIDG company The Emerging Africa Infrastructure Fund (EAIF) its 2019 prize for African Fundraising Deal of the Year. In 2018, EAIF raised US$385 million to continue its core strategy of mobilising public and private finance for investment in private sector infrastructure projects across Africa, often in fragile states. The fundraising met all of IJGlobal’s criteria to qualify for and win the African Deal of the Year award; it moved the market forward, featured significant complexity, overcame many obstacles, created opportunities for new market participants and can deliver positive social and economic impact. The lending group for the US$385 million includes long-standing lenders KFW, the German development bank, FMO, the Dutch development finance institution, and Standard Chartered Bank. The African Development Bank (AfDB) returned as a lender. For the first time, EAIF attracted a large commercial institutional investor in global insurer Allianz. EAIF’s equity is provided by the governments of the United Kingdom, The Netherlands, Switzerland and Sweden. Since its foundation in 2002, EAIF has invested around US$1.3billion, which has been instrumental in attracting over US$10.9 billion of private capital investment to over 70 projects in some 22 sub-Saharan countries. The EAIF portfolio is mapped against the UN’s Sustainable Development Goals, ensuring that projects can directly, demonstrably and quantifiably contribute to positive impact across the continent. EAIF is part of the Private Infrastructure Development Group (PIDG). PIDG blends public and private finance to reduce investment risk, promote economic development and combat poverty in low-income countries and fragile states. Allianz’s investment in EAIF was a landmark event in the drive by PIDG companies to attract greater levels of funding from institutional and commercial sources. EAIF is managed by Investec Asset Management, which led the fundraising. The award was presented to the EAIF team at an event in London on 21st March.